Edinburgh’s Trams will be running by May 2014, the city council announced. According to the council statement, the capital’s streets would be clear of roadworks by 19 October after six years of construction. Tram testing process between the airport and Edinburgh Park will begin earlier in the month. 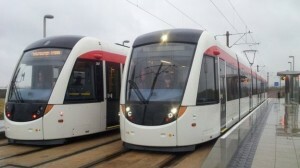 Test trams will be running along the entire route to the city centre by December. Edinburgh City Council’s transport convener Lesley Hinds welcomed the new end date for the project and said: “I’m very keen for it to be finished even earlier if possible”.